Gerald died Friday, April 1, 2016, at the Butler County Healthcare Center in David City. Gerald was born March 21, 1929, near the Lone Star Trading Post area, to Jay Carl and Abbie Bell(Woods) McDonald, the youngest of ten children. He lived most of his life in Bellwood and was a baptized member of the United Methodist Church in Bellwood. On January 23, 1948, he married Maxine Mais in Schuyler. To this union, three children were born;LeRoy Gerald, Linda Kay and Gerald Walter, Jr. Jerry worked for 46 years driving a maintainer for the Savannah and Alexis Townships. Previously he had worked for Commercial Builders of Columbus and Bellwood Lumber Company. 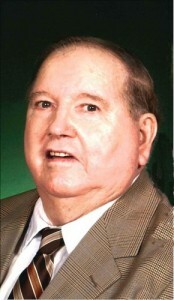 Jerry served on many boards and committees at his church and was very active in the Bellwood community. He had served as Mayor and councilman four different times. He also had served on school boards for Districts 79 and 3R. He was instrumental in starting Boy Scout Troop 178 and served as Scoutmaster for several years. His hobbies included fishing, golfing, camping and most of all he enjoyed helping others. He helped start the Bellwood Senior Citizens Club and served on the Cemetery Board, helping with work at the cemetery. Jerry is survived by his wife, Maxine of Bellwood, daughter Linda Kay(Ernest) Polacek, Bellwood, son Gerald Walter(Terry) McDonald, Jr. of Bellwood, six grandchildren and 5 great-grandchildren. He was preceded in death by his parents, 4 sisters, 5 brothers, a son Leroy Gerald McDonald and two grandsons; Eric Brandenburgh and Jared Polacek.